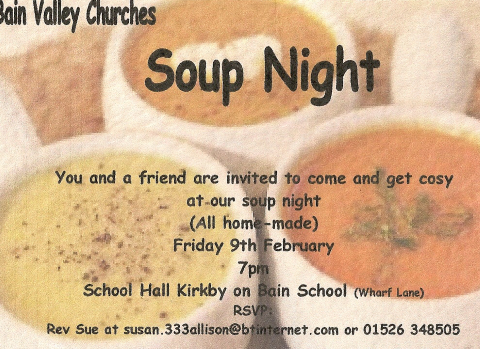 The Bain Valley Churches group invite you to a Soup Night on Friday February 9th at 7.pm, in the Kirkby on Bain Primary School hall . RSVP: susan.333allison@btinternet.com or call 01526 348505. This entry was posted in events, News, Things to do and tagged church, community, events, invitation, soup by peterdewrance. Bookmark the permalink.